← Worcester, MA Launch for The Incredible Sestina Anthology! Come to An Incredible Sestina Reading at the Mass Poetry Festival on May 3! There’s going to be An Incredible Sestina Reading at the Massachusetts Poetry Festival, which takes place in Salem, MA on May 2-4. Here’s the direct link to tell the world you’re going. The readers/panelists will include myself, Michael Costello, Vincent D. Infante, Ravi Shankar, Peter Jay Shippy, and Jade Sylvan. 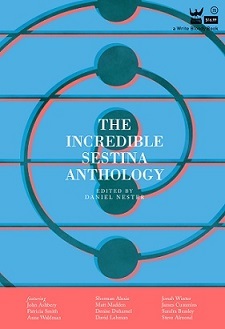 We will read sestinas from The Incredible Sestina Anthology, some others, and hopefully people will write some sestinas right there on the spot. Because that’s how we will roll. Our event takes place from 1:30pm-2:30pm, on Saturday, May 3, 2014, in the Peabody Essex Museum’s Bartlett Gallery. An Incredible Sestina Anthology Reading! Description: The sestina is one of the world’s oldest literary forms. It’s also one of the most tricked-out and wacky: six words appear at the end of 39 lines over the course of six, six-line stanzas and a three-line finale. Since it was invented 700 years ago, people keep writing them. Why? Because of the challenge it presents poets to experiment with a six-pack of words and a spiral-based secret code hidden inside. Join us as contributors from The Incredible Sestina Anthology (Write Bloody 2013) read their contributions to the first ever book to collect examples of this mysterious and malleable form that has grown more popular, even trendy, in modern times. Poets will also read another piece by a different author in the anthology. Hosted by Daniel Nester.